340. Other examples of the involucre are seen in the cup of the acorn, the burr of the chestnut, beech, etc. 341. The forms of inflorescence are exceedingly various, but may all be referred to two classes, as already indicated; the axillary, in which all the flowers arise from axillary buds, the terminal, in which all the flower-buds are terminal. 342. Axillary inflorescence is called indefinite, because the axis, being terminated by a leaf-bud, continues to grow on indefinitely, developing bracts with their axillary flowers as it grows. It is also called centripetal, because in the order of time the blossoming commences with the circumference, and proceeds towards the centre in case of a level topped cluster, as the hawthorn, or with the base, and proceeds towards the summit in case of the lengthened cluster, as the mustard. The student will readily perceive that the circumference of a depressed (flattened) inflorescence corresponds to the base of a lengthened one; and also that the centre of the former answers to the summit of the latter. For when the axis or rachis is lengthened, it is the centre which bears it along with it at its apex, leaving the circumference at the base. 343. Terminal inflorescence, on the other hand, is definite, implying that the growth of the axis as well as of each branch is definitely arrested and cut short by a flower. It is also centrifugal, because the blossoming commences with the central flower and proceeds in order to the circumference, as in the sweet-william, elder, hydrangea. In this kind of inflorescence all the flowers are considered terminal because they do in fact (except the first which terminates the axis) terminate lateral branches successively produced on a definite plan at the node next below the primary flower. 344. Both kinds of inflorescence are occasionally combined in the same plant, where the general system may be distinguished from the partial clusters which compose it. Thus in the Compositae, while the florets of each head open centripetally, the general inflorescence is centrifugal, that is, the terminal head is developed before the lateral ones. But in the Labiatae the partial clusters (verticil-asters) open centrifugally while the general inflorescence is indefinite, proceeding from the base upwards. 345. Of centripetal or axillary inflorescence the principal varieties are the spike, spadix, catkin, raceme, corymb, umbel, panicle, thyrse, head. 340. 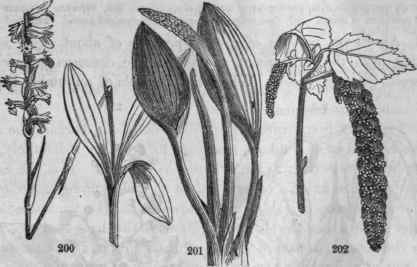 The spike is a long rachis with sessile flowers either scattered, clustered, or crowded upon it, as plantain, mullein, vervain. The so-called spikes of the grasses, as wheat, timothy, are in fact compound spikes, bearing little spikes or spikelets in place of single flowers. 347. The spadix is a thick, fleshy rachis with flowers closely sessile or imbedded on it, and usually with a spathe, as in the Arum, or without it, as in the Typha. 200, Spiranthes cernua; flowers in a twisted spike. 201, Orontium aquaticum; flowers on a naked spadix. 202, Betula lenta: flowers in aments. 348. The catkin or amentum is a slender, pendant rachis with scaly bracts subtending the naked, sessile flowers, and usually caducous, as in birch, beech, oak, willow. 349. The raceme is a rachis bearing its flowers on distinct, simple pedicels. It may be erect, as in hyacinth, Pyrola, or pendulous, as in currant, blackberry. 350. The corymb differs from the raceme in having the lower pedicels lengthened so as to elevate all the flowers to about the same level, as in the wild thorn. 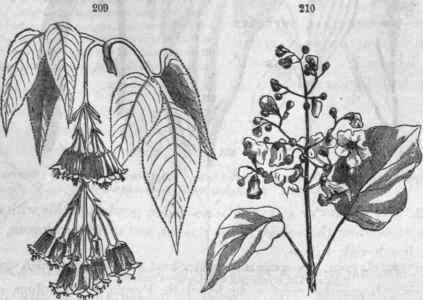 203, Andromeda racemosa; flowers in a secund raceme. 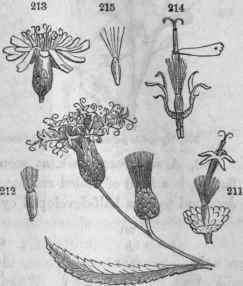 204, Verbascum Blattaria; raceme, 205, Lolium perenne; a compound spike or a spike of spikelets. 206, Dipsacus sylvestris; head with an iuvolucre of leaves. 207, Osmorhiza longistylis; a compound umbel. 20S, Its fruit. 351. An umbel consists of several pedicels of about equal length radiating from the same point, the top of the common peduncle, as milk-weed, ginseng, onion. When the pedicels of an umbel become themselves umbels, as in caraway and most of the Umbeliferae, a compound umbel is produced. Such secondary umbels are called umbellets and the primary pedicels, rays. 200, 8taphylea trifolia; a pendulous, paniculate cyme. 210, Catalpa; a panicle. 352. The panicle is a compound inflorescence formed by the irregular branching of the pedicels of the raceme, as in oats, spear-grass, Catalpa. 353. A thyrse is a sort of compact, oblong, or pyramidal panicle, as in lilac, grape. 354. 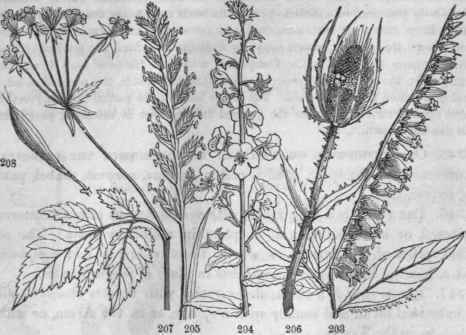 A head or capitulum is a sort of reduced umbel, having the flowers all sessile upon the top of the peduncle, as in the button snake-root, button-bush, clover. But the more common examples of the capitulum are seen in the Compos-itae, where the summit of the peduucle, that is, the receptacle, is dilated, bearing the sessile flowers above, and scalelike bracts around, as an inVolucre. 355. The capitulum of the Compositae is often called a compound flower from its resemblance, the involucre answering to a calyx, the rays to the corolla. The flowers arc called florets, those of the outer circle, florets of the ray, generally differing in form from those of the central portions, the florets of the disk. 356. Of terminal inflorescence THE FOLLOWING VARIETIES are described: cyme, fascicle (verticilaster), glomerule. Vernonia fasciculata; flowers in a discoid head with an imbricated involucre. 211, A single flower remaining on the receptacle. 212, A fruit crowned with the pappus. 213, Mulgc-dium; a head. 214, A single flower remaining on the receptacle. 215, A fruit with pappus. Diagrams; 216 of a cyme; flowers numbered in the order of their development 217, Cyme fas-tigiate. 21S, Cyme half developed - a scorpoid raceme. 357. Cyme is a general term denoting any inflorescence with centrifugal evolutions, but is properly applied to that level-topped or fastigiate form which resembles the corymb, as in the elder. If it is loosely spreading, not fastigiate, it is called a cymose panicle, as in the chick-weed, spergula, etc. If it be rounded, as in the snowball, it is a globous cyme. 220, Myosotis palustris; scorpoid racemes. 219, Stellaria media; a regular cyme. 358. A scorpoid cyme, as seen in the sundew, Sedum,' and borrage family, is a kind of coiled raceme, unrolling as it blossoms. It is understood to be a half-developed cyme, as illustrated in the cut. 359. The peculiar evolution of the cyme is well illustrated in the chick-weed (Alsine media). The first opening flower terminates the axis and stops its growth. Then from the pair of axils next below issue two opposite branches, each bearing a pair of leaves and a terminal flower. Next, the same process is repeated with each of these two branches, and so on indefinitely. Thus the stem becomes repeatedly forked, each fork having an older flower in its angle. 360. Evolution of the scorpoid raceme. But let only one branch be developed at the node next below the flower, and that always on the same side, and wo have a scorpoid raceme or cyme. Other irregulari-ties occasioned by partial development may also variously disguise the cyme. 361. Fascicle. This is a modification of the cyme, with crowded and nearly sessile flowers, as in sweet-william (Dianthus). 362. Glomerule, an axillary tufted cluster, with a centrifugal evolution, frequent in the Labiatae, etc. 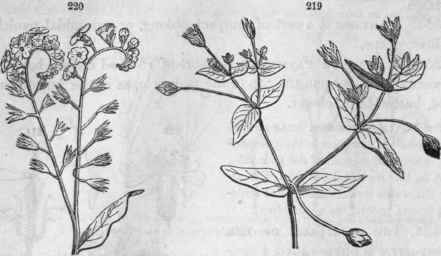 When they occur in the axils of opposite leaves and meet around the stem, each pair constitutes a ver-ticilaster or verticil, as in catmint, hoarhound. 221. 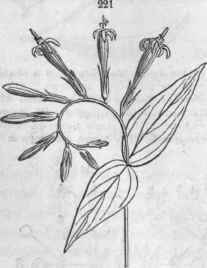 Spigelia Marilandica; a scorpoid raceme. Diagrams illustrating the forms of inflorescence; graduated from the spike to the compound umbel, showing how related to each other. The entire inflorescence is sometimes transformed into attenuated tendrils, as in the grape.